On a warm, calm summer morning, Richard, who comes to us from Vancouver, B.C., left his instructor Jason on the ground at Reid-Hillview airport to take to the skies for his first solo flight. Little did he know that tower would fly a pipeline helicopter right under his final approach path to runway 31R! Keeping his cool, Richard maneuvered over the helicopter and settled gently onto the runway. Flying is constant learning and experience, so congrats on handling the challenges aviation introduces. 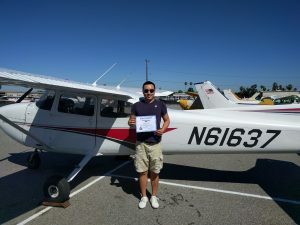 Tags: Cessna 172, first solo, KRHV, pilot, reid-hillview, San Jose.